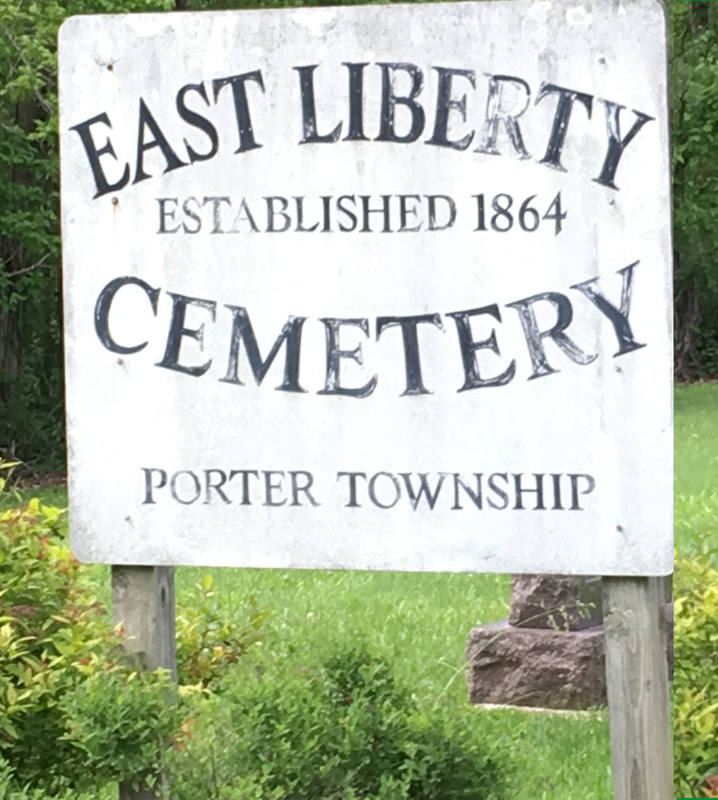 Porter Township Cemetery . . . . 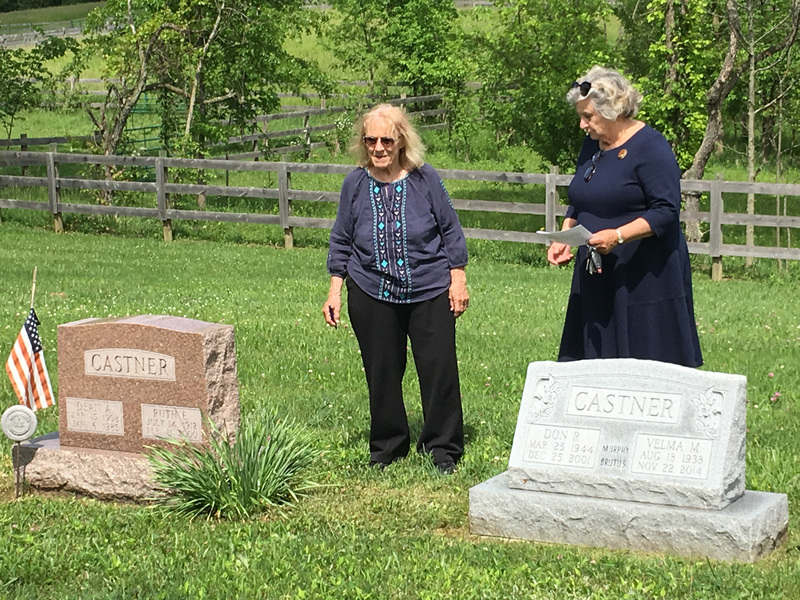 In June 2017, Sunbury Halter and Saddle 4-H Club Alumni Suzanne Allen Sherry Buel, And John Van Sickle were joined by cousin Julia Perfect Teuschler in marking graves of veterans of WWII in East Liberty Cemetery. Roberts, Corporal James Frank Jr. 1894-1966. Enlisted in the Army in 1916 in Columbus, Ohio; Served in Battery C134 Field Artillery during World War One during 1917-1918. Saunders, Private Edward R. (Eddie), 1890-1958. Enlisted in the National Army on April 1, 1918 in Delaware, Ohio; Served in Ohio Company B 3 Machine Gun Company during World War One; Served in American Expeditionary Forces from September 2. 1918 to September 5, 1919; Received Honorable Discharge on September 25, 1919. Castner, Private 1st Class Dean A. 1909-1985. Served in the U. S Army, Battery B with the Army Transport Service on the ship Thierry’ Served in Honolulu, Porto Rico, Fort McDowell, Cristobal, Panama. Kenney, Corporal Edwin A., 1909-2000. Enlisted August 21, 1930 and served in Hawaii in the U. S. Army until released on November 27, 1932. Williams, Troy Estes, 1913-1999. 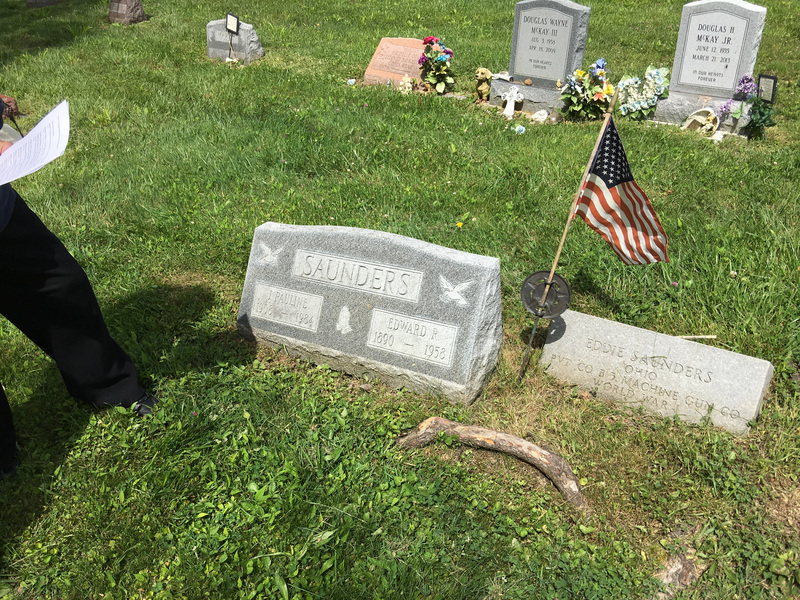 Enlisted in the Ohio National Guard in 1927; Served as a mechanic in the Med. Det. 166th Infantry; Discharge in 1941; Enlisted on October 16, 1941 at Porter Township Hall; Continued serving in the National Guard as a mechanic. Beacom, Corporal Joe Albert, 1923-1994. Enlisted August 18, 1944; Served in the U. S. Marine Corps during World War Two; Released August 18, 1946. Bowsher, Private Charles Stanley, 1918-2003. Enlisted on April 4, 1945 at Fort Hayes in Columbus, Ohio; Served in the U. S. Army during World War Two; Released August 23, 1946. On left is a relative of Bowsher who was in the cemetery putting glowers on his grave and Allen. Jordan, Private Paul Ernest, 1926-2007. Enlisted in the U.S. Army on February 28, 1944 at Fort Benjamin Harrison, Indiana; Served with the 513rd Parachute Company during World War Two; taken as a Prisoner of War. Kenney, TEC 5 Arthur George, 1924-2003. Enlisted July 27, 1943 in Columbus, Ohio; Served in the U. S. Army in the 735th Tank Battalion of the 26th Infantry Division during World War Two; Injured when serving as a Tank Commander in European Theater; Awarded a Purple Heart. Kirk, SI Roy David, 1926-1991. Enlisted May 16, 1944 in the U. S. Navy during World War Two; Released May 11, 1946. McKay, 1st Lieutenant Robert Butcher Sr. 1915-1978. Enlisted on February 4, 1944 in the U. S Army during World War Two; Released on February 12, 1946. Roberts, Private Carl T., 1921-1996. Enlisted October 15, 1943 in the U. S. Merchant Marine during World War Two; Released on November 19, 1945. Scholer, QM2 Edward Frederick, 1920-2011. Served in the U. S. Coast Guard/U. S. Navy during World War Two; Served on the ship, Mattole; Mustered out May 7, 1944. Castner, SP4 Don Rodney, 1944-2001. Son of Dean Castner. Served in the U. S. Army in Vietnam.